Oregon and Oregon State may have vastly different seasons, but one thing they share in common? Potent quarterbacks. The Ducks' Marcus Mariota and the Beavers' Sean Mannion prepare to battle Saturday in the Civil War. 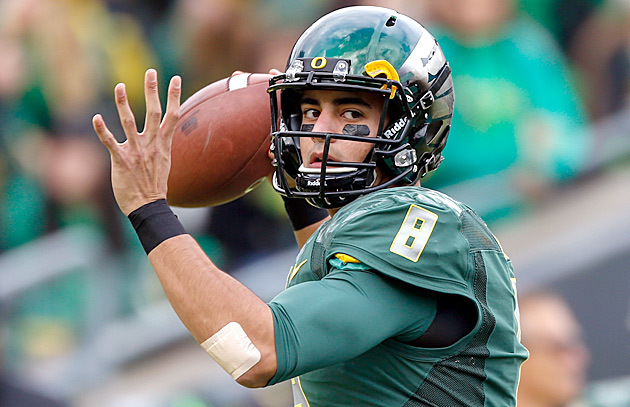 EUGENE, Ore. -- How’s this for a unique footnote in the story of the best quarterback, and possibly best player, in Oregon football history: Marcus Mariota grew up in Hawaii and didn’t play in a Civil War until 2012, but he got his introduction to Oregon football through the 2009 edition of one of the oldest rivalries in college football. Known around the Northwest as the (Civil) War for the Roses, 2009 is remembered fondly for its stakes: Winner goes to the Rose Bowl. The Beavers hadn’t been there since 1964, the Ducks since 1994. Led by Hawaii-born quarterback Jeremiah Masoli, the Ducks won 37-33, earning a date with Ohio State in Chip Kelly’s first year as head coach. Then a junior at Saint Louis High, the same high school Masoli attended, Mariota watched from Honolulu. The 2014 edition may be remembered for something special, too: Never before in Civil War history have two quarterbacks of this caliber matched up. Their records -- Oregon is 10-1 overall, 7-1 in conference and will play in the Pac-12 title game regardless of Saturday’s outcome; Oregon State is 5-6 overall, 2-6 in conference and will miss a bowl unless it stuns the Ducks -- differ, but it’s hard to deny the talent of Mariota and Oregon State’s Sean Mannion. To be clear, this is a conversation neither of them wants any part of. Mariota and Mannion are both dramatically different and surprisingly similar. Mariota is one of the best dual-threat quarterbacks in the country, a player lauded for his ability to keep drives alive and torch defenses with his legs. 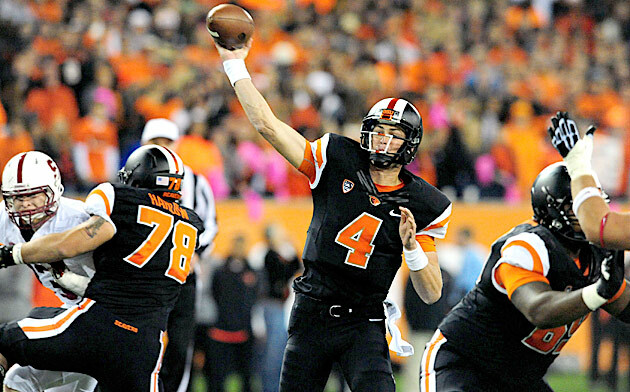 Mannion, a coach’s son praised for his football IQ and accuracy, is built for pro-style offenses. Good luck getting either of them to talk about themselves; besides being two of the best players in the country, they might be the two most boring. A Eugene-based reporter likes to tell of a time she sat next to Mariota at a Thai restaurant. With an order befitting of his tepid temperament, Mariota dined on pad Thai, served mild. Neither quarterback would ever refer to themselves as humble, hard-working or nice, but those are usually the first words out of coaches’ and teammates’ mouths when describing either of them. Statically, it’s hard to argue anyone has been better for either program. Mannion enters the game as the Pac-12’s all-time leading passer with 13,438 yards and boasting a school-record 82 touchdowns. Mariota has passed for 9,445 yards and rushed for an additional 2,064 more, accounting for 120 total touchdowns. He owns eight school records. Thirteen years ago, Oregon native Joey Harrington put the Ducks on the college football map, demanding that attention be paid out west when a billboard of him rose in Times Square. Harrington, who finished fourth in the 2001 Heisman Trophy voting, led the Ducks to a No. 2 national ranking after winning the 2002 Fiesta Bowl, sparking a conversation that Oregon should have played for the 2002 BCS title. Now Oregon looks primed for a trip to the inaugural College Football Playoff, led again by a program-changing quarterback. Mannion, by contrast, has had a trying year. After he turned down an opportunity to declare for the NFL at the end of last season -- he was given a third-round draft grade by scouts – Mannion’s team has been plagued by injuries to the offensive line and a young receiving corps still finding its way. Still, he says there have been no regrets about returning. • ​ELLIS: Bowl Projections: Where are Oregon, Oregon State headed? “I look at where I am now as a player, compared to a year ago, and I’m a much better quarterback,” Mannion says, adding that he “loves this program so much” he opted to return for his teammates as much as for individual improvement. Mannion is likely to graduate Oregon State without a Civil War win -- he’s 0-2 so far, as the Ducks are on a six-game win streak -- a harmless blemish on an otherwise impressive resume but a footnote that nags at Riley. The quarterbacks, who live just 45 minutes from each other, had never met until this past summer, when they were both counselors at the Manning Passing Academy. They traded small talk and complimented each other’s games. In some ways, Mannion and Mariota seem more comfortable talking each other than talking about themselves. They figure chatter about their individual accomplishments is for everyone else -- just like the discussion about them being the two best to ever play in the same Civil War game. • ​BECHT: Where does Oregon State rank as possible playoff spoiler?